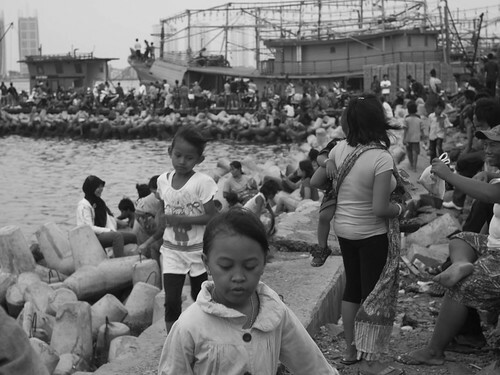 Seaside in the Muara Angke fishing port in North Jakarta area. This pier is located near the fish auction site beyond the fish market. Being a fishing port, there's no sandy beach, only seaside protected with wave breaker concretes and not exactly intended to be recreation spot. But faced with cost, many locals come here to just enjoy a “weekend by the sea” with their family or to come and fish in the polluted water. In the background is a ferry boat that service passengers from this port to the island.